A sleek, black, concept Mars rover is seen at the Kennedy Space Center Visitor Complex in Cape Canaveral, Florida. The rover will tour the U.S. East Coast this summer for the center's Summer of Mars program. There's off-roading, and then there's off-roading on Mars. And from the looks of this concept rover, it's a vehicle that can handle any terrain on Earth (and beyond). This sleek, black, monster of a Mars rover is a concept design of a vehicle that might one day transport astronauts across the Red Planet. 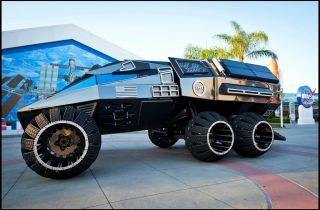 To me, it looks like "The Martian" met a tank with a "Knight Rider" obsession and spawned a Mars car that runs on awesome. "As with all 'secret missions,' we are limited at this point as to what we can reveal about it," they wrote. "We will share the exciting updates and information very soon." According to Business Insider, the concept rover was designed by Marc Parker of Parker Brothers Concepts. It's 23 feet long (7 meters), 13 feet wide (4 m), 11 feet tall (3.3 m) and weighs an estimated 5,000 lbs. (2,268 kilograms), Business Insider reported. A quick look at the Visitor Complex's Summer of Mars website revealed a tantalizing clue. The rover is part of the complex's new Astronaut Training Experience attraction that's opening in the fall. And the rover is not staying in Florida this summer! Like any good rover, it's hitting the open road. "Check back here for cities and dates of the rover's East Coast tour this summer!" the website reads. So, if you live on the East Coast, keep an eye out for this concept Mars rover's road show this summer!